Drug discovery is a time-consuming, high-investment, and high-risk process in traditional drug development. Drug repositioning has become a popular strategy in recent years. Different from traditional drug development strategies, the strategy is efficient, economical and riskless. There are usually three kinds of approaches: computational approaches, biological experimental approaches, and mixed approaches, all of which are widely used in drug repositioning. In this paper, we reviewed computational approaches and highlighted their characteristics to provide references for researchers to develop more powerful approaches. At the same time, the important findings obtained using these approaches are listed. Furthermore, we summarized 76 important resources about drug repositioning. Finally, challenges and opportunities in drug repositioning are discussed from multiple perspectives, including technology, commercial models, patents and investment. Drug discovery is a time-consuming, laborious, costly and high-risk process. According to a report by the Eastern Research Group (ERG) , it usually takes 10-15 years to develop a new drug. However, the success rate of developing a new molecular entity is only 2.01% , on average. As demonstrated in a report by the Food and Drug Administration (FDA), the number of drugs approved by the FDA has been declining since 1995 . 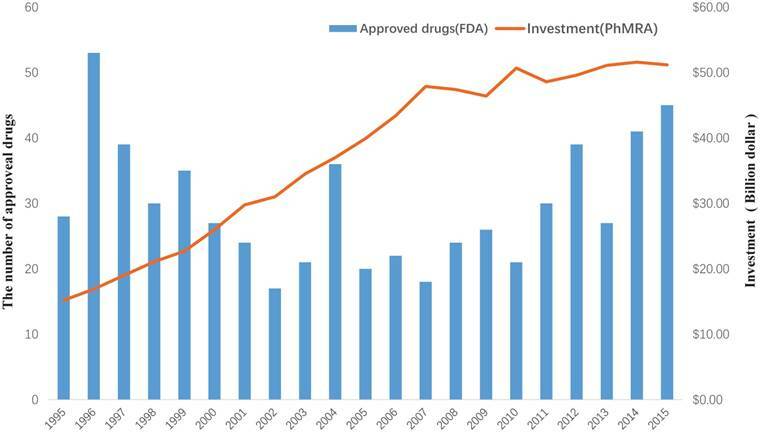 Moreover, investment in drug development has been gradually increasing, as reported by Pharmaceutical Research and Manufacturers of America (PhRMA)  (Figure 1). This indicates that the cost of new drug development will continue to grow. Hence, it is urgent to find a new strategy to discover drugs. Drug repositioning, also known as old drugs for new uses, is an effective strategy to find new indications for existing drugs and is highly efficient, low-cost and riskless. Traditional drug development strategies usually include five stages: discovery and preclinical, safety review, clinical research, FDA review, and FDA post-market safety monitoring [4, 5]. However, there are only four steps in drug repositioning: compound identification, compound acquisition, development, and FDA post-market safety monitoring (Figure 2). Due to the fast growth of bioinformatics knowledge and biology big data, drug repositioning decreases the time cost of the drug development process significantly. Researchers only need 1-2 years to identify new drug targets and 8 years to develop a repositioned drug, on average . Furthermore, the research and development investment required for drug repositioning is lower than that for traditional strategies. Drug repositioning breaks the bottlenecks of cost for many countries. It only costs $1.6 billion to develop a new drug using a drug repositioning strategy, while the cost of the traditional strategy is $12 billion . Thus, drug repositioning offers an opportunity for many countries to develop drugs with lower investments. In addition to reducing the time cost and investment, drug repositioning is also a low-risk strategy. A risk-reward diagram is often used to describe the relationship between a risk and the reward on investment . 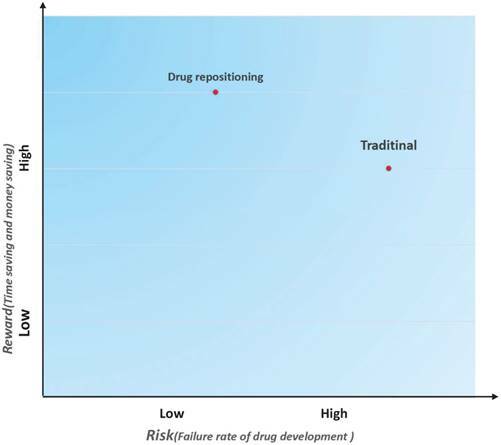 We drew a risk-reward diagram to compare repositioning and traditional drug development strategies (Figure 3). As shown in Figure 3, drug repositioning holds a higher reward with a lower risk. Because repositioned drugs have passed all clinical tests in Phase I, Phase II, and Phase III, their safety has been confirmed. In addition, some repositioned drugs may be marketed as molecular entities and have more opportunities to be pushed into the market once a new indication is discovered. The investment in drug development by PhRMA member companies and the number of approved drugs by the FDA from 1995 to 2015. The contrast of traditional drug development and drug repositioning. A) Flowchart of the traditional drug development process. B) Flowchart of drug repositioning. The main issue in drug repositioning is the detection of novel drug-disease relationships. To address this issue, a variety of approaches have been developed including computational approaches, biological experimental approaches and mixed approaches. With the fast development of biology microarray techniques, various drug and disease knowledge databases such as DrugBank , ChemBank , OMIM , KEGG , and Pubmed  have appeared, and massive genomic databases such as MIPS, PDB , GEO , and GenBank  have been built (see Resource section for details). This knowledge and data further promoted the rapid development of a variety of novel computational approaches. Compared to biological experimental approaches, computational approaches have much lower costs and much fewer barriers . In this review, we mainly introduce computational approaches. Most existing computational approaches are based on the gene expression response of cell lines after treatment or merging several types of information about disease-drug relationships  that can be divided into different types from different viewpoints [19-21]. For instance, some researchers grouped drug repositioning methods according to the biological networks used , and others divided drug repositioning methods into two types: data-driven and hypothesis-driven . However, the above studies did not focus on methodology. 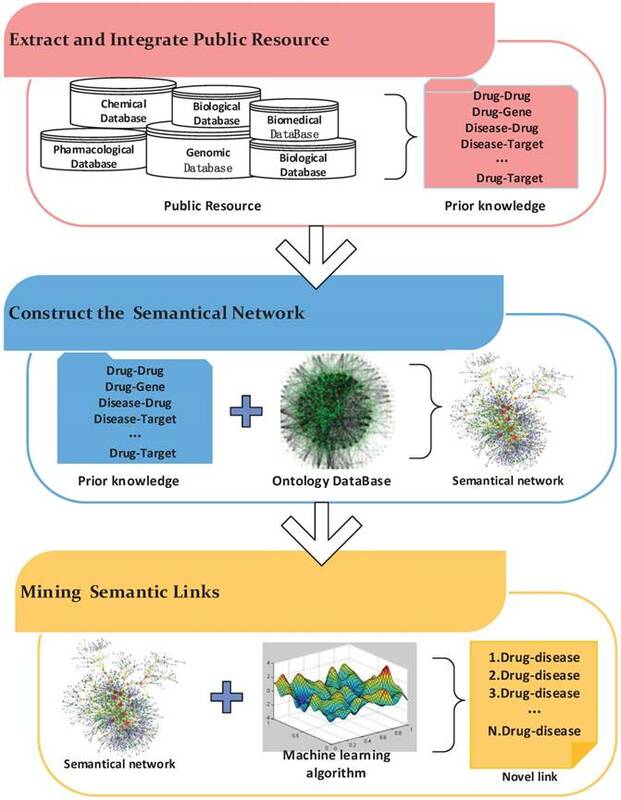 In this paper, we emphasized the core methodologies of drug repositioning approaches, so we divided them into three categories: network-based approaches [22-32], text-mining approaches [33-45] and semantic approaches [46-49]. Network-based approaches are widely used in drug repositioning due to the associated ability to integrate multiple data sources. These approaches have been proposed in the past few decades and became a hot topic approximately ten years ago. In this section, two types of network-based approaches are reviewed: network-based cluster approaches [22-24, 26] and network-based propagation approaches [27, 29, 31, 32, 50]. Inspired by the fact that biologic entities (disease, drug, protein, etc.) in the same module of biological networks share similar characteristics, network-based cluster approaches have been proposed to discover novel drug-disease relationships or drug-target relationships. These approaches aim to find several modules (also known as subnetworks, groups or cliques) using cluster algorithms according to the topology structures of networks. These modules include various relationships such as drug-disease, drug-drug or drug-target relationships. The most common network-based cluster approaches, including DBSCAN , CLIQUE , STING , and OPTICS , cannot detect overlapping clusters. To address this problem, Lu et al. studied the drug repositioning of SCLC (small-cell lung cancer) using a k-means-based network cluster algorithm. Chemical-chemical interactions and chemical-protein interactions were utilized to select candidate drug compounds that had close associations with approved lung cancer drugs and lung cancer-related genes. The experimental results revealed that the proposed algorithm predicted some drugs for treating SCLC, indications which were verified by retrieving references. Tamas´ et al. proposed a greedy network cluster approach named ClusterONE with two kernel components: cohesiveness score and greedy growth process. There are three steps in the approach: (i) generating growth groups from the greedy growth process using high-cohesiveness seed nodes, (ii) merging highly overlapping group pairs, (iii) discarding some complex groups according to the threshold. The advantage of the approach is its generality, and it can accurately predict not only disease-drug relationships in disease-drug networks but also protein interactions in protein-protein networks. Yu et al. proposed an approach to construct disease-protein-drug networks based on a symmetrical conditional probability and detection of modules on the network via the ClusterONE algorithm. As a result, potential disease-drug interactions were found—for example, the authors discovered that iloperidone could be used to treat hypertension. Wu et al. developed a novel approach through combining ClusterONE and Louvain  to detect modules in a heterogeneous network built from KEGG  disease-drug and drug-target data. They found 98 clusters and 1160 pairs of disease-drug interactions—for instance, vismodegib was predicted to treat Gorlin syndrome, while its original indication was basal cell carcinoma. Luo et al. presented an approach named MBiRW with three steps: (i) calculating a comprehensive similarity between drugs and diseases; (ii) obtaining drug-drug subnetworks, disease-disease subnetworks and drug-disease subnetworks; and (iii) finding drug-disease relationships using a bi-random walk algorithm. Some novel disease-drug relationships such as Alzheimer's-levodopa were found (see Table 1). Network-based approaches are vital for drug repositioning. Researchers often need to make a decision in selecting appropriate approaches, and we summarized these approaches in Table 1 and listed their benefits, bottlenecks, key findings, databases and other information. The networks employed in these approaches can be divided into two classes: homogeneous and heterogeneous. As disease pathways can be constructed from protein-protein interaction (PPI) network analysis , a protein-protein interaction (PPI) network, as a homogeneous network, is often employed in some approaches [22, 60, 61] used to identify drug targets involved with multiple pathways. Along with the deeper research associated with the network, the accuracy of PPI networks has been enhanced because numerous PPI databases have been established and updated by experiments. However, PPI networks are limited since they only include protein information without considering additional information. With the advent of the era of big data, the accumulation of various medical data (such as drugs, diseases, and targets data, among others) has made it possible to construct complex heterogeneous networks. Heterogeneous networks, which integrate multiple sources of information including genomes, proteomes and metabolic pathways , typically contain two-layer (i.e., disease-drug) or three-layer (i.e., disease-drug-gene) relationships and have attracted researchers' attention. Different biological entities included in the heterogeneous networks not only provide an opportunity to improve the performance of existing methods but also offer a tool to design more efficient and stable approaches [24, 26, 27, 29, 31, 55, 58] (see table 1). networks Some complex proteins This method considers both local and global information from networks. The workflow of text mining. From the method perspective, network-based cluster algorithms are frequently used to find interesting modules, and network-based propagation algorithms are often used to infer new relationships between biological entities. Network-based cluster approaches are general because most network-based cluster algorithms can be employed for detecting biological modules. For example, some cluster algorithms in the social network analysis field can be employed for detecting modules in biological networks [25, 63]. However, there is a challenge of network-based cluster approaches in that there exists no gold standard to test associations among biological modules. Network-based propagation approaches are easy to implement and can make accurate predictions. Researchers can obtain an AUC value and estimate the prediction results. In addition, network-based propagation approaches use not only information from the selected components but also information from expanding components. Along with the exploration of drug repositioning, a great deal of medical and biological literature containing fruitful novel biological entity relationships have been published. There is a large challenge in extracting novel and valuable biological entity relationships from the literature. Text mining (TM) techniques have been widely used to address this problem and have been increasingly developed to mine new knowledge from scientific literature and identify connections between biological concepts or biological entities. Marti Hearst gave a general definition for text mining as 'text mining is the discovery by computer of new, previously unknown information, by automatically extracting information from different written resources' . The main pipeline of biological text mining includes four phrases: information retrieval (IR), biological name entity recognition (BNER), biological information extraction (BIE) and biological knowledge discovery (BKD) (Figure 4). In the IR step, relevant documents are extracted from the literature. These relevant documents need to be filtered because there are some useless concepts in documents. In the BNER step, valuable biological concepts are identified with controlled vocabularies. In the BIE and BKD steps, useful information is extracted to discover knowledge about biological concepts and build a knowledge graph. At the same time, potential associations between knowledge, such as drug-disease and drug-target relationships, can also be detected. The origin of text mining methods in the medical field is the Swanson 'ABC' model, which states that if concept A is connected with concept B, and concept B is involved with concept C, then concept A may have a novel connection with concept C . Based on the 'ABC' model, various text mining methods have been proposed to find potential disease-drug relationships in the literature. A number of studies have been devoted to applying text mining techniques in drug repositioning. Li et al. developed an approach to building disease-specific drug-protein connectivity maps combining network mining and text mining. In the proposed method, they first extracted disease-protein relationships from molecular interaction networks using network mining. Then, they searched for drug terms indirectly associated with certain diseases such as Alzheimer's disease (AD) in PubMed abstracts through text mining techniques. Finally, drugs and proteins could be linked through drug-disease or disease-protein relationships. As a result, diltiazem and quinidine are hypertension and arrhythmia drugs, respectively, but authors have also found that the two drugs could be used to cure Alzheimer's disease, which has been confirmed by clinical evidence. Ruggero et al. proposed an approach to building sentence graph networks using text mining techniques. The proposed network can be used to discover relationships between any drug and any disease. These relationships are specific paths among the biomedical entities in the graph network. A novel disease target of sarcoidosis was identified using this approach. Rastegar et al  extracted drug-gene and gene-disease relationships from medical abstracts to obtain drug-disease relationships using a rank score. To evaluate the performance of the proposed approach, the obtained drug-disease relationships were validated in the Comparative Toxicogenomics Database (CTD). Experimental results indicated that the discovered relationships confirmed in CTD were highly confident. Jang et al. developed an approach to building dependency graph networks through extracting sentences with genes, drugs and phenotypes from biomedical literature. They calculated the possibility that a drug treats a phenotype based on drug-phenotype associations. The authors compared the predicted drug-phenotype associations using known drug-phenotype associations in databases and proved the good performance of their method. Kuusisto et al  proposed another text mining method named KinderMiner to identify potential indications of some old drugs. The method is based on co-occurrence statistics between drugs and diseases in the literature. As a result, new indications of some drugs such as Zestoretic, Zebeta, and Tiazac were found. Zhang et al. reported an algorithm to prioritize anti-AD (Alzheimer's disease) targets. The authors extracted 224 genetic variations, 14 epigenetic modifications, 98 proteins and 86 metabolites associated with AD using text mining and integrated these interactions to construct a weighted sum model to prioritize potential anti-AD drug targets. With the development of natural language processing (NLP) techniques, increasing numbers of text mining tools have been developed and used to discover repositionable drugs (see [38, 39]). Here, we summarized the inputs, outputs and characteristics of these tools in Table 2. The inputs of these methods are usually biological terms extracted from existing literature, and the corresponding outputs are lists of relationships of biological terms. The confidence levels of the relationships are generally evaluated using computational approaches or biological experiments. These tools can be divided into two categories: static tools and dynamic tools. Static tools were built on steady databases or documents with large size. Due to the large data size, the time performance of these tools was poor. To address this problem, indexes for documents or records were created to accelerate the query process in static tools. For example, DrugQuest  is a type of query tool for detecting drug-drug relationships. The workflow of this tool includes five stages. (i) Query, in which users provide a query term to retrieve related documents. (ii) Name entity recognition, which identifies proteins, chemicals and pathway terms in related documents using a biomedical concept recognition service named BeCAS  and identifies significant terms closely associated with the query by calculating the TF-IDF score (Term Frequency - Inverse Document Frequency) to measure the importance of terms. (iii) Building document network, which uses the similarity of documents. (iv) Clustering, in which various clustering algorithms (MCL, K-means, hierarchical clusters) are employed to cluster documents on the network. (v) Visualization, in which the 'tag cloud' technique is used for representing cluster results. The DrugQuest tool is promising for knowledge discovery and drug-drug relation prediction. However, the proposed tool only supports the DrugBank database, which leads to limitations of the query results. Other query tools [39, 40, 68, 69] were also designed in a similar way (see table 2). Text mining tools for drug repositioning. Static tools usually cause outdated result problems. To address this issue, many dynamic tools [41-45] that update their document databases daily were developed. However, these tools also need more time to handle user queries. To reduce the time cost of queries, cache and index techniques were employed in dynamic tools. For example, PolySearch2  used a cache technique to reduce the response time, and BEST  used an indexing technique to reduce the computation time. BEST is a biomedical search tool that returns a list of 10 different types of biomedical entities including genes, diseases, drugs, targets, transcription factors, miRNAs, and mutations for a query. The proposed tool consists of two parts: an indexing subsystem and a search subsystem. In the indexing subsystem, the authors used a dictionary-based approach to extract entities from the text and create a document-entity to list paired indexes. To avoid the outdated results problem, the tool automatically downloads abstracts newly indexed from the PubMed system and updates the document-entity indexes every day. In the search subsystem, the proposed tool utilizes the inverted index to obtain matched query terms. All entities obtained from the query are ranked according to their integrated entity scores involving entities and query terms included in all documents. BEST is a real-time and constantly updated tool, for which the time performance and output quality are both considered. Text mining tools reduce the time complexity of drug repositioning and assist researchers in verifying their experimental results by returning massive amounts of biological entity relationships. However, there are still some issues that need to be addressed. For example, the limited coverage problem is one limitation of text mining tools, which means that partially important biomedical entities or relationships such as mutations, targets, and drugs are not considered. Therefore, there is an urgent need to improve the performance of existing text mining tools. Semantics-based approaches are widely used in information retrieval, image retrieval and other fields. Recently, these methods have been applied to drug repositioning. The workflow of these methods mainly includes three steps (Figure 5). First, biological entity relationships are extracted from prior information in massive medical databases to build the semantic network. Then, semantics networks based on existing ontology networks are constructed by adding the prior information obtained in the previous step. Finally, mining algorithms are designed to predict novel relationships in the semantic network. Based on a hypothesis in which similar drugs are correlated with similar targets and similar targets are connected to similar drugs, Guillermo et al. proposed an unsupervised algorithm to predict drug-target relationships. The authors constructed a semantic network including drug-drug, target-target, and drug-target relationships. The proposed approach, which combines semantics link prediction methods and edge partition methods, was evaluated on a network. Due to substantial semantics knowledge being used, the proposed method made accurate predictions about drug-target relationships. Mullell et al. presented a semantics data-driven algorithm for drug repositioning. The authors used a Bayesian statistics approach to rank drug-disease relationships according to prior knowledge. Then, they integrated ranked relationships with other biological entity associations to construct a semantical drug discovery network. To infer drug-disease relationships, the author applied an algorithm for detecting semantic subgraphs. As a result, nitrendipine, a potent blocker of the calcium channel (CACNA1S) used to treat hypokalemic periodic paralysis, was found. Chen et al. built a semantic linked network consisting of over 290,000 nodes and 720,000 edges with multisource data including drugs, targets, proteins, and disease pathways. Then, the authors applied a statistical model to predict drug-target relationships. Consequently, the proposed model identified some drug-targets pairs and drugs for repurposing. For example, barbiturate, a drug used for treating migraines, was predicted for use in curing insomnia with literature support. Zhu et al. proposed an automatic reasoning approach for heterogeneous semantics networks. Biological entities (such as drugs) are converted to labels in a semantics network. Then, disease-drug relationships are obtained from automatic reasoning techniques. As a demonstration, the authors reported that tamoxifen, a drug used for treating breast cancer, can treat ovarian cancer, which was confirmed by the literature . Semantics-based approaches take full advantage of semantics information included in massive amounts of literature. Therefore, the precision of predicting biological entity relationships was improved. However, there is a still challenge in constructing a semantic network by integrating multisource data. It is urgent to construct semantic networks that contain fruitful medical data. Along with the development of biological technology and the accumulation of various omics data (genomics, proteomics or metabolomics, etc. ), more databases from chemical, medical, pharmacological and biological fields have been established. We summarized 80 widely used databases or resources that can be used for designing drug repositioning approaches. The workflow of a semantic network inference. Pharmacological databases [8, 71-76] are crucial resources for drug repositioning. These databases collect not only drug property data but also data on interactions between drugs and other biological entities. Pharmacological data lays the foundation of various computational approaches. For instance, DrugBank  is a unique bioinformatics and cheminformatics resource that combines detailed drug data with comprehensive drug target information. Many computational approaches, especially network-based approaches [23-26], were designed based on this database, which achieved excellent results (see table 1). Proteomics databases [13, 14, 76-78] are another type of the data resource for drug repositioning. Most important protein-protein interaction (PPI) networks from proteomics databases are the basis of network-based drug repositioning approaches. In addition, proteomics databases are also important resources for building heterogeneous networks such as drug-protein-disease networks. One of the famous proteomics databases is MIPS , which includes manual high-quality PPI data from scientific literature. MIPS can provide PPI information for some network approaches [61, 77]. Moreover, it is a good resource for evaluating the experimental results of some computational approaches. Chemical features of drugs provide important information for designing chemical-based approaches. Publicly available databases  [79-84] of chemical structures contain massive amounts of useful information such as 2D topological fingerprints and 3D conformations. Chemical information on drugs is usually employed for predicting novel drug structures to find new indications for drugs having similar structures. PubChem  is a famous database for chemical molecules structures. The database contains a massive amount of 2D data that can be used to measure the similarity of drugs and to construct chemical networks. With further studies of drug repositioning, enormous amounts of medical and biological literature that contain novel biological entities relations have been published. Collecting massive amounts of literature is a necessary task for researchers; hence, many medical literature databases [10, 12, 86] have been built. Based on these valuable medical textual data, text mining approaches were proposed for drug repositioning (see Section Text mining-based approaches). PubMed  is the most widely used literature database. It comprises more than 27 million citations for biomedical literature from MEDLINE, life science journals, and online books. Citations may include links to full-text content from PubMed Central and publisher websites. Many text mining tools and search engines have been built using these databases (Table 2). Although increasingly more databases are being established, choosing proper approaches to mine novel knowledge is still a large challenge. It is necessary to discover the potential value of the increasing databases and medical literature for designing efficient drug repositioning approaches. We collected these resources in supplementary materials Tables S2 to help researchers choose proper approaches. Traditional drug development strategies are costly, failure-prone, and expensive ventures. Therefore, drug repositioning has recently drawn attention and brings drugs out faster for clinical use. However, drug repositioning is a complex process involving multiple factors such as technology, commercial models, patents, investment and market demands. Although many medical databases have been established, selecting the appropriate approach to make full use of massive amounts of medical data is still a challenge. It is urgent to develop new approaches for drug repositioning. The intellectual property (IP) issue is another highlighted issue to be solved. For repositioning drugs, IP protection is limited . For example, some novel drug-target-disease associations found by repositioning researchers were confirmed by publications or online databases; however, it is difficult to seek IP protection for such associations because of the law. The IP issue prevents some repositioned drugs from entering the market. Moreover, some repositioning projects are forced to be abandoned, which is a waste of time and money . It is necessary to develop a new commercial model because the traditional commercial model is a serial model and causes overlapping investment issues. Opportunities come with challenges. The first example of drug repositioning was an accidental discovery in the 1920s. After about a century of development, more approaches have been proposed for accelerating the process of drug repositioning. For this reason, drug repositioning has acquired great achievements. In supplementary materials Table S1, we list 75 drug repositioning examples collected from the comprehensive literature. Massive machine learning algorithms were introduced to improve the performance of drug repositioning in this scenario. In addition to computational approaches, experimental approaches that give direct evidence of links between drugs and diseases were developed, such as target screening approaches [87-91], cell assay approaches [92-95], animal model approaches [96-99] and clinical approaches . These approaches are reliable and credible. In recent years, increasing numbers of researchers have combined computational approaches and experimental approaches to find new indications for drugs, called mixed approaches [59, 100, 101], wherein the result of computational methods was validated by biological experiments and clinical tests. Mixed approaches offer opportunities for developing repositioned drug effectively and rapidly. Generating secondary patents provides an opportunity for researchers to find new indications for existing drugs. With the IP problem solved, many repositioning projects have been conducted smoothly with low cost, which has aroused concern from many countries. With regard to the commercial model, parallel strategies bring significant improvement in the efficiency of drug repositioning. For example, multiple tests or studies are conducted for a candidate drug, which reduces the time cost for drug repositioning. From the market perspective, a large number of diseases require new drugs to be treated, which brings potential economic benefits. Taking rare diseases as an example, there are over 6000 rare diseases that need to be studied. However, only 5% of them are being researched . Rare diseases are a large potential market to explore. This work is partially supported by the National Natural Science Foundation of China (61471147, 61371179), the Natural Science Foundation of Heilongjiang Province (F2016016), the Fundamental Research Funds for the Central Universities (HIT.NSRIF.2017037), and the National Key Research and Development Program of China (2016YFC0901905). Jie Li designed the paper and is the first coauthor, Hanqing Xue and Jie Li analyzed and wrote the manuscript, Haozhe Xie reviewed the manuscript, and Yadong Wang participated in the preparation of the manuscript. The data supporting the findings of this work are contained within the manuscript.